Finally today I watched the iPad 2 keynote. Steve did open the keynote and got standing ovations. He did wear his blue jeans and black sweater like always, but I had the feeling he lost some weight again. He is since his cancer pretty slim but he looked even slimmer. He did as always a good job with his presentation however it was not as fluent as usual. He stopped a couple of times to find the right word, he almost said twice iPad instead iPod and the other way around. It is recognizable that he is not 100% fit. I was sometimes certain he did wear a bug in his ear to listen to somebody telling him what to say, like a little helper. Nevertheless the keynote was great, even if the magical "one more thing" was missing. He gave us some impressive numbers. 100,000,000 books in iBooks downloaded. We all know since yesterday that 15 million iPad got sold and around 10 million iPhones have iBooks installed. Each iBooks install comes with at least one free book (Winnie the Pooh). This means out of the 100 million downloaded books are already 25 million downloaded without doing anything. Even if we don't count them, then it is only 4 books per mobile device, which is not much if we count the iPad partly an e-book reader. 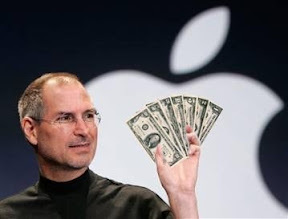 Apple paid over 2 billion USD to their app developer community. So we have 230k paid apps. This is in average $7,000 revenue per app. We have around 72,000 Active Publishers in the US App store. If 30% only offer free apps then we have about 50,000 publishers which made money with their apps, which would be in average $40,000 per publisher revenue, which is not too bad. You don't make a living but it is a nice income. However the average revenue might be less, because the free apps have usually iAds and the $2 billion paid to developers do include iAds. The numbers seem at the end not high, but still higher than right now the competition can offer. Over 200,000,000 iTunes accounts with credit cards. Basically only Facebook has more members if we see Apple as a social network, but the difference is, that Apple's members are paying members. If each of the accounts spend only $1 a month, then this is per year $2.4 billion a year revenue. Nice. Jobs noted that Amazon doesn't release comparable numbers for the accounts it holds, but suggested that this may be the largest collection of credit-card-backed accounts anywhere on the Internet. If it were a country, iTunes would be the fifth largest in the world, smaller than Indonesia but bigger than Brazil. It is impressive that a company like Apple can generate within 9 months almost $10 billion revenue from one product which costs in average $633. This means the most sold iPad is the 16GB 3G version or the 32GB no 3G.